How to Get a Broken Key Out of a Lock? Read This! Having a key break off in a lock may feel like the end of the world, but it’s not. For most people, the immediate reaction is to get hold of a locksmith, but with a call out charges, this can be a costly option. However, with a few simple tools, you can probably do the job yourself and save yourself a heap of money. First things first, what are you going to need? Now you have all the things you are going to need; it’s time to play locksmith. Before we start attempting to get the broken key out of the lock we need to spray the inside mechanism with penetrating oil. It should be well soaked and flushed with oil to make removal easier. Most penetrating oils now come with straw attachments to direct the jet of oil into crevices and small spaces. If you have a silicone lubricant that will do, just as well and make things slide a lot easier. Take a good look at the lock and see where the key has broken off in the lock, and how much of the key has broken. Look at the broken piece of a key you have in your hand. If this piece includes key cuts, then the lock will probably still be aligned in the locked or unlocked position. 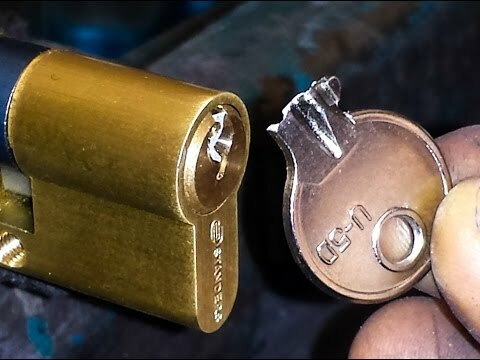 If it is just the head of the key, then you may have turned the barrel of the lock part of the way before the key snapped. Using the screwdriver, turn the barrel of the lock with the broken key back to the vertical which will leave the lock in the default open or closed position. You will not be able to remove the broken piece of the key from any position other than the open or closed position. The needle-nosed pliers may do the job just as well as a screwdriver. At this point, you can try using the needle-nosed pliers to remove the broken key from the lock. If the lock is well lubricated and properly aligned in the locked or unlocked position, it may just need a careful pull for the broken bit to come free. If this doesn’t work, then we have to resort to using a jigsaw blade to work as a key extractor. Locksmiths have a special tool they use to remove broken keys that has a number of barbed edges that can grip onto the cuts of a key and pull it out from the lock. With no access to one, we can make our own with a thin hacksaw or jigsaw blade. Wrap some duct tape around one end of the jigsaw blade, so it is easy to hold in hand. Then gently side the blade with the teeth pointed downward into the lock alongside the broken key. Get the blade as far in as possible and then give a gentle turn, so the teeth are right against the broken key. Slowly pull backward on the saw blade feeling for the teeth catch onto one of the key cuts. The The blade should then be able to pull the broken key out of the lock. As the key begins to come out of the lock you should be able to grab the broken bit with the needle-nose pliers to remove it completely. 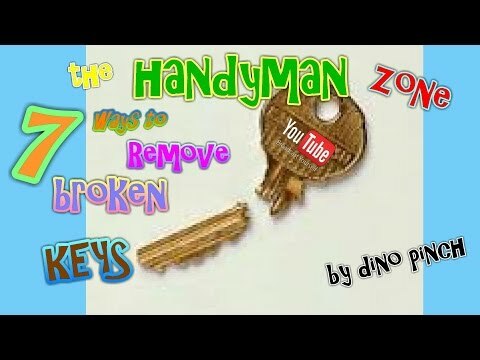 Don’t throw away the broken bits; if you take them to a locksmith, he will be able to make you a new key following the pattern of the old one. Prevention is better than cure, so it is wise to look at the keys you regularly use to check for signs of wear and fatigue. All keys will start to weaken and crack by the head from being used daily. If you see any cracks or thining at the point where the head meets the key cuts, it is time to get a new one made. You can take the strain off the keys by using lock lubricant on a regular basis.